Mark Nepo is the author of twenty books, including Seven Thousand Ways to Listen, The Endless Practice, and the #1 New York Times bestseller, The Book of Awakening. His work has been translated into more than twenty languages. Mark traveled the country with Oprah Winfrey on her sold-out 2014 “The Life You Want” tour and has appeared several times with Oprah on her Super Soul Sunday program (OWN TV). He lives in southwest Michigan. Visit him online at MarkNepo.com and ThreeIntentions.com. 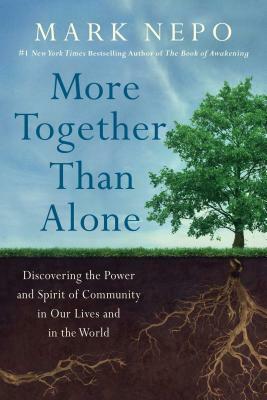 "More Together than Alone is a beautifully crafted message from the heart, a powerful cry that we are one, interconnected living community, stretching through time and space. Weaving together stories with profound reflections, this book strikes at the deepest need of our time. It is such a profound book, so many stories across millennia, so much on which to meditate deeply, that a few words of endorsement seem inadequate. Mark Nepo offers a vital message that belongs to all of our human history, but is especially needed at this moment in our shared destiny." "What is more needed in our time than a book about the power and promise of community, a book rooted in the simple fact that we are part of one another, whether or not we know it? And who better to issue the call to community than a gifted poet and philosopher who’s spent his life helping to “stitch the world together?” Every word in this book has been tested in the fire and can be trusted. So please read this book, breathe in Mark Nepo’s teachings, and help stitch the fabric of trust across our tattered world." "In this dazzling series of meditations, Mark Nepo returns us to an enduring truth: We must love one another—or perish. Just as medieval monks kept literacy alive during the dark ages, he shows us how we too must keep alive the literacy of the heart, no matter how deafening the noise of hate. For this essential task, More Together Than Alone is required reading." "A series of short, optimistic pep talks with a collective message: We can all get along. . . . Readers feeling a need for an inspirational kick in the pants will enjoy this book"
"A poignant and timely meditation on the importance of community, and demonstrates how we live more enriching lives by cultivating connectedness." "A timely reflection on the importance of community and how we can deepen our sense of togetherness to improve both our individual lives and the world." "Poet and spiritual writer Mark Nepo, one of our Living Spiritual Teachers, brings to this masterwork on community his skills of observation, his ability to reflect in universal terms, and his personal openness to the many ways people approach their life together." "More Together Than Alone is not a business book, but any person, in any business, can heed Mark Nepo's call." — Anthony Salvanto, author of Where Did You Get This Number? "Mark Nepo has written a guidebook for our complicated, polarized time, with his poet’s heart and compassion . . . The combination of practicality and inspiration leaves readers with hope for our world, and gratitude for this beautiful book."